As 2007 draws to a close, I thought I’d look back on the year and consider the high and lows and bits inbetween. A year ago, this blog wasn’t even a glint in my eye, and yet here we are with my 125th post, and over 95,000 visits (from you lot) on the clock. Who’d’ve thunk it. Due credit to Andrew Wildman, who pretty much told me to do a blog and set things up for me here on WordPress. Mind you, if ever there was a time to start blogging, it was 2007, which was exceptional in terms of the sheer high profile of Transformers, largely (though not totally) due to the advent of a certain live-action Michael Bay blockbuster. Naturally enough, given how intertwined Transformers and I have become, my workload and the scope of the yearly signing/convention circuit expanded accordingly. The year kicked off with the movie uppermost in my mind, as I was working on both the Movie Prequel comics (with IDW’s Chris Ryall) and DK’s Transformers: The Movie Guide (book). The former was very rewarding, both in terms of the co-writing (which I hadn’t done a lot of) and the finished product (with Don Figueroa proving once and for all that he’s great at drawing more than just giant robots). The latter was less so, largely because we kept running into both the lack of available imagery (meaning that certain characters, such as Starscream and Ironhide, never made it into the book at all) and limitations on the scope of the book itself. Great (in my opinion anyway) spreads on the human cast sadly fell by the wayside (though I did get a more complete movie/book experience with the later Top Trumps/Transformers book). And, above and beyond the TF movie-verse, I was still rolling out scripts for the ‘ongoing’ (Escalation and then Devastation) series and the Spotlights, crafting the ever-expanding IDW/TF-verse. It’s here, perhaps, that I felt my most solid work of 07 was to be found, simply because we were building something we largely controlled from the ground up, something that was unique in and of itself, and thereby the amount of latitude to do something grand and cohesive was immense. Odd sidelines, such as the Madman/DVD insert comic, which bridged the gap between the G1 cartoon and the animated movie (sort of), were also great fun, not least because artist Nick Roche clearly was having such fun with it. 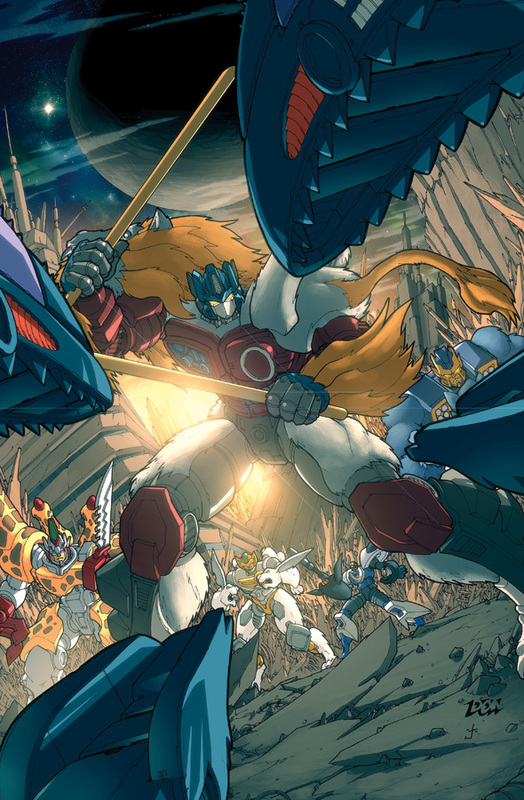 07 also saw the second series of Beast Wars in print (for the most part) and–finally!–the Beast Wars Sourcebook. The only low in all this was Don Figueroa’s subsequent decision to more or less finish on Transformers (hopefully for the time being only). Can’t say I blame him, given how much was asked of him, but Don… you’ll be missed! Overall, it was a great year for Transformers work, made more so by the launch of Titan’s UK Transformers comic/magazine (the first homegrown title since Panini’s brief foray into the world of TF Armada). Working with Geoff Senior again on a Transformers comic strip was truly an event to be treasured. Hope we get to do it again (soon). Beyond the world(s) of Transformers, there was Terminator 2 – Infinity, a five-issue series for Dynamite that I was, after the event, genuinely pleased with in terms of both execution and story (I’m hyper-critical of my own stuff when it sees print, and yet I found little I’d actually want to change in T2 – Infinity). Nigel Raynor’s art was exemplary (consistently so), which always helps. Then there was Wallace & Gromit and A.T.O.M. and Teenage Mutant Ninja Turtles and Cougar (though that’s yet to see print) and probably other bits and pieces I’ve (already) forgotten about, all of which provided a welcome change of pace from battling robots. And, in the midst of all this, film journalist Mark Salisbury and I even got to write a (spec) film script, which got us some positive feedback from film companies and agents but no actual deals. Had great fun doing it, largely because it flexed a very different writing muscle, and (having done one) we intend to do another in 08. Of course, there were projects in 07 that got so far but no further. Casualties include The Horror Collection, a New Line ‘monster’ themed partworks from Eaglemoss (to which I contributed several text features). That one didn’t get past its 5-issue test run. Various mooted Transformers partwork-style projects (from the same company) came and went too, though the movie version (The Transformers Battle Card Collection) did get at least get its (limited) 5-issue test run. The final verdict’s still to come on whether that one will go any further. I’ll keep you posted. Other things that didn’t fly were a Battlestar Galactica series I pitched to Dynamite and my attempts to get some work on the Shaun the Sheep animated series. Can’t win ’em all. Appearance-wise it was a very busy year, with conventions in Derry (my personal favourite), Bristol, San Diego, Dublin and London and assorted in-store signings (Orbital, Forbidden Planet et al). Strangely, I didn’t go to a single Transformers convention (there were, bizarrely, no UK conventions in 07 and Botcon was just too close, time-wise, to the San Diego Comicon to make it workable). The overall verdict… a packed and eventful year, with Transformers holding sway over all else. Finally… my film of the year: Last King of Scotland. My book of the year: Bad Luck and Trouble by Lee Child. My album of the year: Back to Black by Amy Winehouse. My cultural moment of the year: visiting the Terracotta Army exhibition at the British Museum. My Transformers moment of the year: sat in a San Diego hotel bar (called DW’s Bar strangely enough) with Eric Holmes, EJ Su and Don Figueroa, just putting the world to rights. “Priceless,” as they say in the credit card ads. Look for my ‘… IN WITH THE NEW!’ trailer/teaser for 08 shortly! A big HAPPY HOLIDAYS (from me) to one and all in this the festive season. And special thanks to all of you who’ve visited, commented on or otherwise supported my blogging efforts to date. And here’s a little Xmas something for you all, a look at the Beast Wars series that never was, in the shape of my original script for ‘Shell Game’ issue #1. Created to tie in with the BW Summer Special story published by a certain ex-TF publisher, it differs significantly from what became (in the fullness of time) Beast Wars: The Gathering. Click on the link below to view. Enjoy… and I’ll be back on New Year’s Eve (or before) with my retrospective look at 07 (and maybe a look forward to 08!). It’s the turn of the upcoming Transformers Spotlight Grimlock to get the post-script treatment. As always, what follows is more teaser than spoiler, but if you want to avoid any potential insights into what the issue holds, look away now. Right, here goes: this one’s been a long time coming, inasmuch as I pointedly didn’t want to lean too heavily, too early in the evolution of the IDW/TF-verse, on what’s become almost my signature character across the various eras of Transformers in comic form. But, having trailered Grimlock (and his Dynobots) in Spotlight Shockwave, it was only a matter of time before the linguistically-strangled one (and don’t go reading into that that I’m necessarily going to play IDW/TF-verse Grimlock like previous incarnations!) got a Spotlight of his own. That begged the question, who was IDW/TF-verse Grimlock? How was he different? What drives him? What makes him who he is? I wanted to make sure that this Grimlock was presented as completely as possible as quickly as possible, and that we got well and truly inside his head. Anyway, the actual events in Spotlight Grimlock (as well referencing Spotlight Shockwave, naturally) spiral out of the catastrophic conclusion to Devastation #6, in more ways than one. On the one hand, Skywatch, the alien-aware, off-the-radar government organization responsible for the salvage/reactivation/reorientation of Ravage and Laserbeak (in Spotlight Soundwave, etc), attempt to bolster their ‘pet’ anti-robot robot strike team with a Dynobot (or so). Things, naturally, don’t go to plan (for reasons which will surprise you, I think), and this in turn sets in motion a blazing confrontation with another of the previously-introduced cast (and no, I’m not saying who), who gets some decent page time in Devastation #6. Though self-contained, Spotlight Grimlock is most definitely a sequel to Spotlight Shockwave, inasmuch as it deals with the consequences (to Grimlock himself and the other Dynobots) of Grimlock’s actions therein. Spotlight Grimlock is also a key part of what’s coming next. Its crunching head-to-head opens the door for one of 08’s (several) big ‘events.’ Can’t say more, as I’m sworn to secrecy right now, but it’s a crowd-pleaser! Spotlight Grimlock is drawn by Marcelo Matere and hits in March 08. Don’t miss it, really, DON’T MISS IT. Here we go. As promised, those 20 questions now have the appropriate (or inappropriate, you judge) answers. Thanks to everyone who posted (sorry I couldn’t answer ’em all) and thanks also to Chris Ryall at IDW and Luke (Bassbot). Click here to go to questions (& answers) #1-15 (over at the IDW forums) and read on for #16-20. Enjoy! Beast Wars The Ascending #3 is out, unleashed. The issue hits stores this week (12th Dec in the US, 13th here in the UK). And if you thought things were looking dire for the Maximals (and Predacons) at the end of issue #2, wait’ll you see what #3’s got in store for them (and you). With armageddon (of the Unicron variety) looming for Cybertron, all remaining hopes lie with Razorbeast and his timelost Maximals. But no sooner do Lio Convoy and the Pack arrive back on prehistoric Earth than Razorbeast is infected by Rartorata with Angolmois ‘rage,’ more or less scuppering any last hope. Desperate alliances are formed, tragedies unfold, evil gets the upper hand, time gets all bent out of shape and Shokaract is finally unleashed (much to Big Convoy’s dismay). Their darkest hour… just keeps getting darker. Story is by me, art by Don Figueroa (his last, it seems, for the time being… sniff). Check out Don’s nifty cover art for the issue by clicking on the thumbnail below. Further to my previous post about the upcoming Q&A session, split between here on my blog and the IDW forums, the many questions received (again, both here and on the IDW forums) have been whittled down to a manageable 20, and I’m hoping to have the answers done and dusted by early to mid next week (commencing 10 Dec). Thanks to all those who took the time to post, and apologies to anyone whose question didn’t make the final cut (it was a really tough, there were just so many good, well thought out questions this go-around). Questions/answers #1-15 will appear exclusively on the IDW forums and #16-20 (also exclusively) right here! Definitely on the better late than never scale, here’s my post-script discourse on Transformers (UK) #8 (or at least the original strip bit of it). Another ‘squeezed into a bit of dead space in the movie’ story, this one concerns the fate of Scorponok, last seen burrowing underground in an almightly hurry after the aerial barrage in Qatar. He’s been laying low since then, but when Ironhide and a Special Forces team (new characters, developed especially for the UK storyline) go looking they get a whole LOT more than they bargained for (and realise some things are better left buried). As with the previous Starscream story, this one gives a little more in the way of action/resolution to the movie itself, and provides Ironhide with a real workout (though not necessarily in the way you might think). Scorponok proves to be a much tougher character than his bio and onscreen appearance maybe suggests, and ties up something of loose end. Editor Steve White played his part (above and beyond the call of duty) with this one, taking my half-hearted suggestions for US military hardware and coming up with the real goodies (he’s something of an expert!). Art is by Staz Johnson, another name those of you TF fans with long memories will remember as having worked on the Marvel UK Transformers strip towards the end of its originated life, oh and the art cover is by Gary Erskine. What’s next? Something VERY different. Still new movie-based, but quite epic (taking us right up to issue #13) in its scale and reach. More on this when I do my Script (W)rap for issue #9 (soon, honest!). You are currently browsing the simon furman blog archives for December, 2007.